There are many choices for siding on your home. And although adding new siding can make your home look great, be more energy efficient, and add value to your home there are also things that adding higher quality siding can do for your home that you may not be aware of. 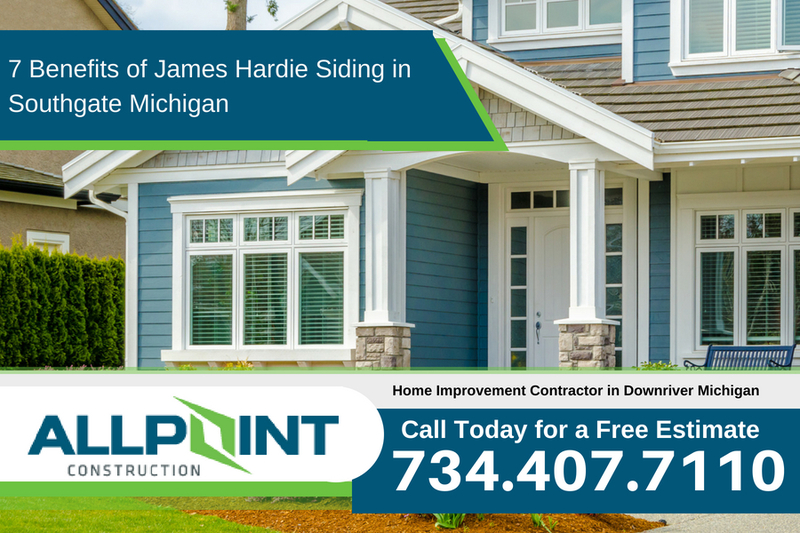 When adding James Hardie siding in Southgate Michigan to your home there are several advantages that you may never consider, until now. I’ll include 7 of the benefits that you may not have considered when getting a home improvement contractor to install James Hardie siding on your home. Has the siding on your home started to fade or simply lost it’s appearance? The siding on your home is one of the biggest factors when considering how much curb appeal a home has. Even if the siding on your home is performing as it should and protecting your home from the weather it can still bring the value of your home down. Installing new siding on your home in Southgate Michigan will increase it’s value and curb appeal. Here are seven of the benefits you can also have when getting new James Hardie siding installed on your home. Add a bit of safety to your home with James Hardie siding. Since it’s not combustible you don’t need to worry about it catching on fire. And although it should not be considered a fire proof wall, it can certainly help keep your home safer. Other types of siding including wood and vinyl siding can be affected by fire and even promote the fire as well. Making your home look great takes a touch of your own sometimes. That certain color that you’ve been considering for your home is available using James Hardie siding in Southgate Michigan. Since James Hardie siding can be painted any color you choose it leaves the choices for color totally up to you. There are also many factory colors to choose from if you want the James Hardie siding painted in house. Either way you have loads of choices for the siding on your home. Have you ever seen what can happen when you get a barbecue grill a bit too close to vinyl siding or seen a rock throw from a lawn mower into the siding. While vinyl siding may look great it simply isn’t that durable. With James Hardie siding there is a backing of the siding that gives it more rigidity and can withstand impacts from weather or the occasional rock flying from under the lawn mower. One thing that is much different than vinyl siding when it comes to James Hardie siding is that it is much thicker. This thickness makes it much better because it doesn’t warp or buckle after being installed. Warping and buckling are common problems for vinyl siding or siding that is not as thick. Both vinyl siding and James Hardie siding attempt to look like a wooden siding. While both can look great, James Hardie siding does a much better job of this and since it is installed in planks even when someone is close to the siding it still holds it’s appearance well and doesn’t look ‘plastic-like’. Once James Hardie siding is installed on your Southgate Michigan home you don’t need to worry about it for many years. The warranty on the siding can be as much as 30 years with 15 year warranty on painting as well as the labor for the siding as well. Be sure to check out the warranty on the James Hardie siding that you choose for your home. Since James Hardie siding is a great choice and a safe choice for your home it can lead to you getting a discount on your home owners insurance. Some home owners get a big discount simply by changing the siding on their homes. Be sure to inquire with your insurance company about the savings you may be eligible for. James Hardie siding should only be installed by properly qualified siding contractors. One of the best siding contractors in Southgate Michigan is All Point Construction. Call All Point Construction today at 734-407-7110 for more information and to get a free estimate on your siding project.